A new twist has been added to the debate about what happened in Baga town, Northern Nigeria on the 26th of April 2013. 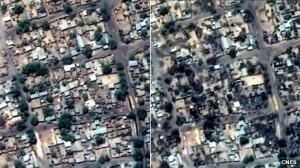 The picture on the left shows Baga Town on the 6th of April 2013, whilst the one on the right shows the town on the 26th of April 2013, ten days after the clash between Boko Haram insurgents and a multinational force comprising of Nigerian, Chadian and Nigerien Soldiers on the 16th of April, 2013. The Nigerian military has vehemently denied committing any atrocities stating that only 30 houses were destroyed with 37 people killed. These satellite images seem to indicate that this not quite an accurate account of events that transpired in Baga. There is a need for more investigation to determine what really happened there.